Domestic violence is prevalent in every community and anyone can be impacted by domestic violence regardless of age, gender, race, nationality, sexual orientation, or religion. One in three women and one in four men will experience domestic violence in their lifetime. Learn more about statistics. Identifying the signs of an abusive relationship can be difficult because the abuser uses subtle tactics to gain power and control over their partner. The victim may first recognize that the relationship is abusive after it has escalated to violenc. In reality, domestic violence is never a one-time incident. 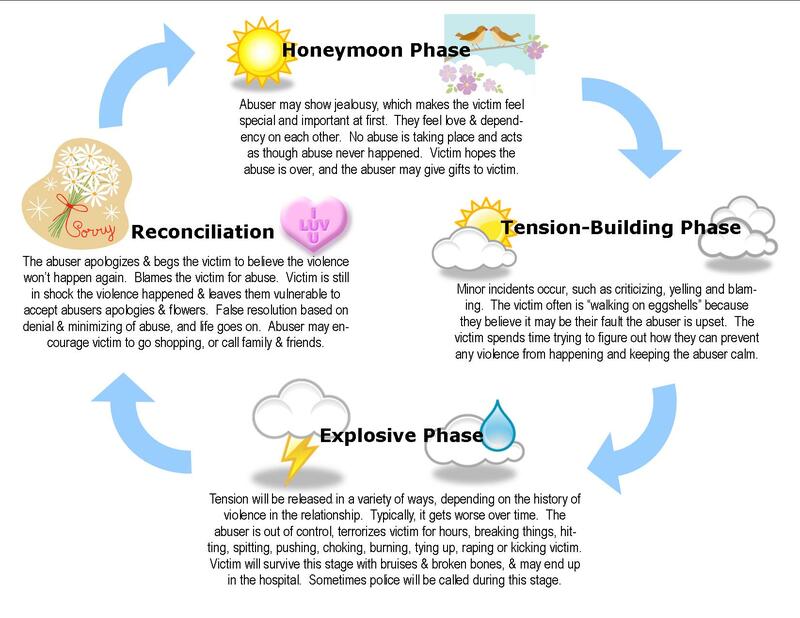 Many relationships follow a pattern known as the Cycle of Violence. Click here to learn more about warning signs of abuse. If you would like to talk about your situation, you can meet with a VIP advocate in person or call our hotline anonymously. We are here to listen and provide support regardless of whether or not you are ready to end your relationship. Leaving an abusive relationshop is the most dangerous time for a victim because they are taking some of the power and control back from their abuser. An advocate can help an individual develop a Safety Plan. If you suspect a friend or family member is in an abusive relationship, talking with them about it can be difficult. The most important thing you can do is to let them know that they have support and that there are options when choosing to leave. It's important to remember that you can't "rescue" your loved one from an abusive relationship. Although it is hard to see someone you care about get hurt, ultimately the person in the relationship needs to be the one who decides to make a change. There are many reasons why a victim may stay in an abusive relationship and many victims return after they have left. Be non-judgmental and respectful of their decisions, even if you don’t agree. Acknowledge their feelings and tell them that you are concerned for their safety. Tell them the abuse is not their fault and that they are not alone. Educate yourself about domestic violence and the resources available in your community. You can meet with a VIP advocate in person or call our hotline anonymously. In 2014, more than two-thirds of children (ages 17 and younger) were exposed to violence within the past year, either directly or as witnesses. Children exposed to domestiv violence may develop social, emotional, and behavior problems.Children may be more likely to exhibit aggressive or antisocial behaviors. Youth that witness violence in the home have been found to have higher levels of anger, hostility, oppositional behavior and disobedience. Research has also shown they suffer from fear, withdrawals, poor social relationships, and low self-esteem. Children experience domestic violence in many ways. They may hear one parent threaten or demean the other, or see a parent who is angry or afraid. They may see or hear one parent physically hurt the other and cause injuries or destroy property. Children may live with the fear that something will happen again. They may even be the targets of abuse. ​To find out about more effects of domestic violence on children or how to help children, click here.